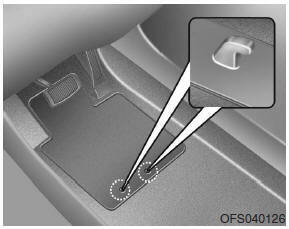 • Ensure that the floor mats are securely attached to the vehicle’s floor mat anchor(s) before driving the vehicle. • Do not use ANY floor mat that cannot be firmly attached to the vehicle’s floor mat anchors. • Do not stack floor mats on top of one another (e.g. all-weather rubber mat on top of a carpeted floor mat). Only a single floor mat should be installed in each position.